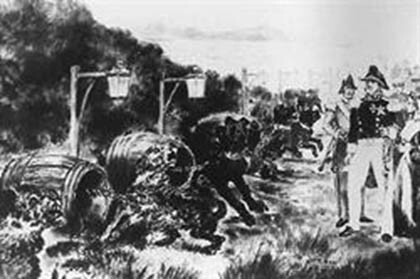 The two narrow land bridges at Eaglehawk Neck and East Bay Neck at Dunalley made escape from Port Arthur virtually impossible for over 12,000 men and young boys who were incarcerated within its dark and forbidding confines between 1831 and 1877. By mid 1832 the officer’s quarters and soldier’s barracks at Eaglehawk Neck had been built to house one officer, a sergeant and twenty soldiers. Soon a store, guardhouse, several sentry boxes, a semaphore station, the infamous ‘dog line’ and a jetty stretching some 300 metres into Eaglehawk Bay were added. The garrison was later extended to house thirty to forty men. The officer’s quarters are thought to be the oldest timber military building in Australia. It is period furnished and open for inspection from 9am to 5pm daily, with free entry. To deter escapees convict labour was used to create a cutting through the sand dunes on Eaglehawk Neck from Pirates Bay to Eaglehawk Bay. A line of six to nine large, vicious dogs were housed in kennels made from old barrels along this gap; close enough for them to touch each other but not close enough to fight each other. Oil lamps were fixed on posts at around chest height along the dog line and cockle shells were scattered on the ground to reflect the light. Later another two to three dogs were chained to wooden platforms in the shallow waters of Eaglehawk Bay to deter escapees from wading across. A bronze replica of a dog with its barrel-kennel and oil lamp is now a feature on the Neck, near the Community Hall. A convict manned whaling station was established on Eaglehawk Neck in 1857 to supply lamp oil to the garrison. A semaphore station, one of 11 established on the Tasman Peninsula by Commandant Charles O’Hara Booth between 1833 and 1840, was erected on top of the dunes at Eaglehawk Neck. The stations enabled messages to be sent by code, using large wooden planks bolted to the top of the station at one end. 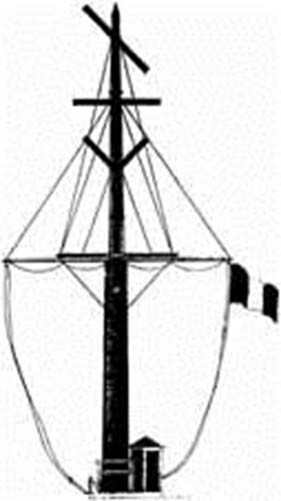 They enabled the garrison at Port Arthur to communicate to Hobart Town, via Eaglehawk Neck and the coal mines at Saltwater River within 15 minutes; mostly to report escapees. Martin Cash, an Irish-born convict, became known as the ‘gentleman bushranger’ after escaping in 1842 with two other men. They survived for some six months in the area by robbing houses and inns without using violence. Cash and his exploits are remembered with a small stone memorial at the Tessellated Pavement car-park (opposite The Lufra Hotel), while the legendary Cash’s Lookout is a fairly strenuous but worthwhile one hour walk up a nearby bush track. Go across the Neck, turn left off the Arthur Highway into Blowhole Road (C338) and look for the sign about half a kilometre along. Go to Martin Cash page for more information. 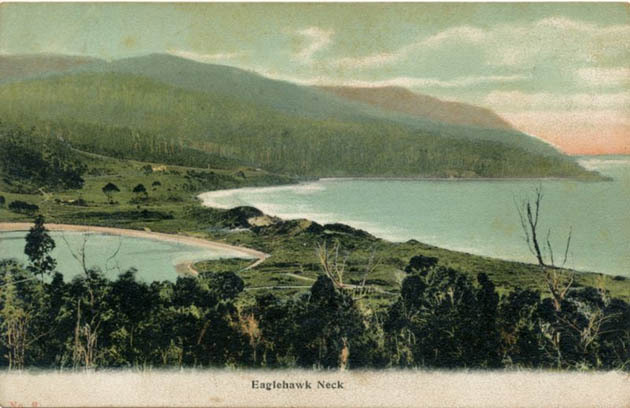 With the closure of the Port Arthur penal settlement in 1877 the garrison at Eaglehawk Neck was abandoned. The land and buildings were then acquired by private settlers. The Costello family ran a farm on the property for most of the 20th century. In 1991 the site was acquired by the State Government and is now managed by the Parks and Wildlife Service (PWS). The first Eaglehawk Neck Post Office was open from 1875 until 1877. It reopened on 11 January 1895 and closed in 1974. The original schoolhouse is now a private residence. Apart from several privately owned properties between the Tessellated Pavement car-park and the Historic Site on the Neck, all land along the foreshore from below The Lufra Hotel to the Blowhole area is now a Coastal Reserve, also managed by PWS under the Pirates Bay Visitor Services Site Plan, 2007 – go to www.parks.tas.gov.au/file.aspx?id=6815 . The best way to see what Eaglehawk Neck and the Tasman Peninsula have to offer in the way of natural beauty is to ask Google Earth. Go to Eaglehawk Neck, Tasmania and explore from there. You will be amazed!